The muscles in the anterior neck can become hypertonic or develop myofascial trigger points as a result of injury, poor posture, or simple overexertion. Some anterior cervical muscles are superficial and easily accessible, while others are deep and difficult to access with soft-tissue therapies. Because of sensitive neurological and vascular structures in the neck, it is important to consider these anatomical challenges when treating the neck. Two primary muscles that lie close to vascular structures in the anterior neck are the longus colli and longus capitis. Practitioners applying manual treatments to these deep neck flexors could run the risk of causing a serious injury to their client, such as stroke or drop in blood pressure, due to the proximity of the vascular structures. One of the structures that can be impacted with pressure from soft-tissue treatment to the anterior neck is the carotid sinus, which is located at the division between the internal and external carotid arteries (Figure 1). There is a slight enlargement of the arterial diameter at this juncture where the two arterial branches separate. 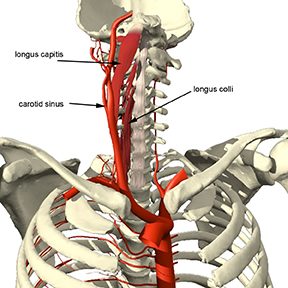 A group of very important sensory cells, called baroreceptors, are also located in the carotid sinus. The baroreceptors play a primary role in the regulation of blood pressure and heart rate. In a condition called carotid sinus hypersensitivity (CSH) or carotid sinus syncope, the carotid sinus develops an increased sensitivity to pressure. Syncope is a term meaning loss of consciousness or postural tone caused by a decrease in blood pressure to the brain. Unintentional pressure on the carotid sinus from massage treatment of deep anterior neck muscles could cause adverse effects on blood pressure or heart rate in a person with CSH. For a person with hypersensitivity in the baroreceptors, even a mild stimulation to the neck can result in bradycardia (reduced heart rate) and a drop in blood pressure.1 However, CSH is not common so clients may not have any problem with pressure applied in this region. For the few that do have this sensitivity, the consequences of pressure on the baroreceptors could be serious. Unfortunately, a massage practitioner would not know if their client had this sensitivity in advance. It is also unlikely that the client would know they have the condition either. Consequently, it is a bit of a statistical gamble to perform massage on the deep anterior neck muscles. There are many practitioners moving away from this type of treatment for safety reasons. There is another concern with pressure applied in the region of the carotid sinus. In addition to housing the baroreceptors, the shape of the carotid sinus allows this structure to be a repository for arterial plaque buildup. Plaque that has collected on the inner walls of the arteries is a well-known danger. Unintentional pressure applied to the carotid sinus could dislodge some of these plaque concentrations causing them to migrate through the arteries and cause a stroke. Practitioners may think that by avoiding pressing on tissues with a pulse, they can feel confident that they are not pressing on vascular structures. However due to the multiple layers of soft-tissues, massage can put pressure on other nearby structures that subsequently press on the arteries, so this method is by no means foolproof. The possibility of adverse affects for anterior neck treatment should lead the practitioner to explore alternatives in soft-tissue treatment for the deep anterior cervical muscles. Reducing hypertonicity can be accomplished by techniques that do not apply direct pressure, such as facilitated or static stretching. Facilitated stretching can be very effective in reducing tightness in the deep neck flexors without putting pressure on the carotid sinus. A position such as that shown in Figure 2 is used for these facilitated stretching methods. However, the practitioner should be cautious even with stretching. Ironically, there is a risk of a different arterial compression with the neck flexor stretching position shown in Figure 2. The vertebral arteries run through the transverse processes of the cervical vertebrae on each side of the neck. They join to form the basilar artery, which then extends into the cranium to supply blood to the brain (Figures 3 & 4). Figure 3: Side view of vertebral arteries Mediclip image copyright (1998) Williams & Wilkins. Mediclip image copyright (1998) Williams & Wilkins. 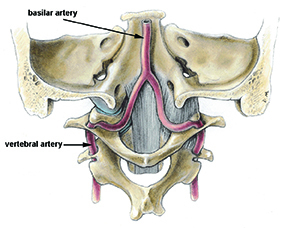 When the head is held in hyperextension or rotation (or a combination of both) the vertebral arteries can be compressed, causing a reduction in blood flow to the brain.2 Compression of these arteries is a condition called vertebrobasilar insufficiency (VBI). Symptoms of VBI include vertigo, dizziness, seeing stars, disorientation, ringing in the ears, or general feelings of sensory disturbance. If the practitioner is working in this area or moving the client’s head into rotation or hyperextension and they report any of these symptoms, treatment should immediately cease and the client’s head should be brought back to neutral. The majority of problems with VBI result from hyperextension or rotation movements of the head. 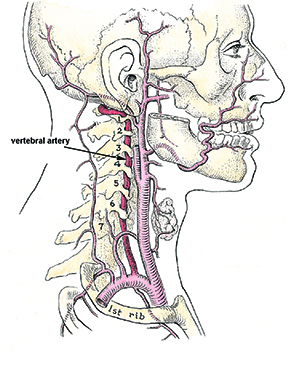 However, due to the location of the vertebral arteries it is possible that VBI could also occur from common massage techniques in which pressure is applied to the suboccipital region. While it is a rare occurrence, some people could have VBI from techniques such as those depicted in Figure 5, with only the weight of the head applying pressure. Techniques where pressure is on the occiput and not the suboccipital soft tissues will not cause VBI. Problems occur when pressure is applied directly into the suboccipital soft tissues. There is a way to test for the possibility of vertebral artery compression prior to performing massage techniques. This procedure is called the vertebral artery test and it is considered an accurate means of predicting VBI.3 To perform the test, the practitioner has the client in a seated position and instructs the client to hold their head in extension or extension with rotation (as if looking over the shoulder). If within about 30 seconds, the client reports the beginning of VBI symptoms the practitioner should consider the client susceptible to arterial compression. Techniques that would put the client in a position that could aggravate the compression should then be avoided. Massage is one of the safest interventions for treating soft-tissue pain and injury conditions in the cervical region. However, soft-tissue therapy is not benign. As these examples show, there are times when massage or other soft-tissue therapies could have serious detrimental effects and that requires the practitioner to think carefully about appropriate treatments to these sensitive areas. 1. Wijetunga M, Schatz I. Carotid Sinus Hypersensitivity. e-Medicine. 2005. Accessed 3-15-2009. 2. Dabus G, Gerstle RJ, Parsons M, et al. Rotational vertebrobasilar insufficiency due to dynamic compression of the dominant vertebral artery by the thyroid cartilage and occlusion of the contralateral vertebral artery at C1-2 level. J Neuroimaging. Apr 2008;18(2):184-187. 3. Mitchell J, Keene D, Dyson C, Harvey L, Pruvey C, Phillips R. Is cervical spine rotation, as used in the standard vertebrobasilar insufficiency test, associated with a measureable change in intracranial vertebral artery blood flow? Man Ther. Nov 2004;9(4):220-227.